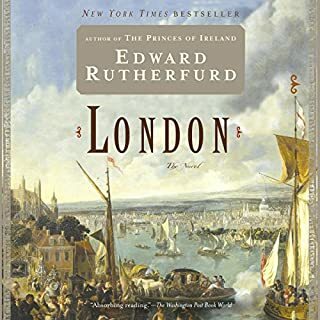 ©1987 Edward Rutherfurd (P)1994 Blackstone Audio, Inc.
Sarum tells the entire history of England, from its ice-age prehistory when the first men arrived on the island to the 1980s, by focusing the passing of ages on the city of Salisbury, once known as "Sarum." Located on the edge of Salisbury Plain, at the juncture of five rivers, archeological evidence tells us it's been a trading settlement since prehistoric times (and of course, it is located only a few miles from Stonehenge). Rutherfurd uses a mixture of archeology and recorded history to tell us the complete history of Sarum from the arrival of Hwll the Hunter, seeking high ground as the ice melts, to the last in the line of the Shockleys and Masons, who have entertained us with their family dramas for centuries, trying to restore Salisbury Cathedral in 1985. How historically accurate is this book? It would take a historian to criticize that aspect of Rutherfurd's storytelling, though obviously everything involving the neolithic settlers, followed by the bronze age settlers, ancestors of the Celts, and pretty much everything up to Roman times, has to be more speculation than known fact. To this day, we don't know for sure exactly when Stonehenge was built or for what purpose, and I remember an Irish history professor in college telling me "Don't believe anything anyone writes about druids - crazy people write about druids." So Rutherfurd's take on the bloodthirsty rites of these Bronze Age tribesmen is probably as likely as any other. 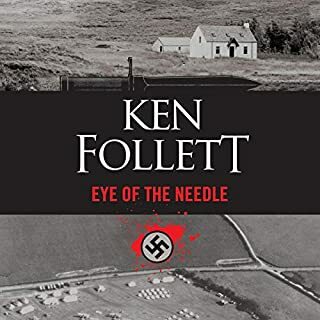 This is not primarily a history book, though, but a multi-generational (many, many, many generations) soap opera, through which history is told. Of the many families living around Sarum, Rutherfurd invents several — the Wilsons (descended from "Will's son" though actually present as fisher-folk living on Sarum's rivers since the Ice Age), the Masons (descended from a medieval mason, who was himself descended from an old Celtic craftsman who learned architecture from the Romans, who was himself descended from the architect of Stonehenge), the Porters (descended from a Roman officer named Porteus), the Godfreys (descended from a Norman knight), the Shockleys, the Forests (a branch of the Wilsons that renamed themselves something more noble once they got money) — who frequently change names and reverse fortunes and have interwoven lives, feuds, and marriages with the passing of centuries. The family that ruled Sarum in Roman times becomes in the 19th century the tenant farmers living on land owned by another family that were Anglo-Saxon peasants in the 11th, and so on. Naturally they don't know their ancient noble (or common) origins the way the reader does, other than as family tales passed down which they believe to be largely fictitious, like Doctor Barnagel, who laughs at his family's legend of being descended from a Danish invader known for crying "Bairn nae gel!" ("Don't kill the children! "), not knowing that it's actually true. This is a historical epic told through the eyes of everyday people. Rutherfurd has each of his families passing down physical and personality traits through the generations that are more fanciful than genetic, but there is something pleasing and familiar in seeing what the scheming, "spider-like" Wilsons are up to in each century, or what form the next generation's incarnation of a buxom, Amazonish Shockley girl will take. It sprawls across all of history. How are these families affected by the Roman invasion? The Anglo-Saxon invasion? The Danish invasion? The Norman invasion? The Black Death? The Reformation? The English Civil War? The New World? The Napoleonic Wars? 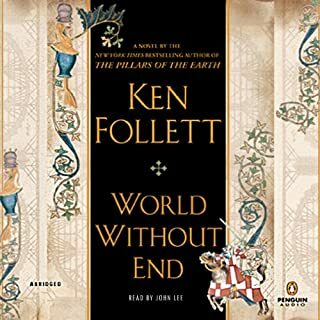 All the way into the 20th century, where things became a bit rushed, covering the passing of time from World War I to 1985 in as many pages as earlier were spent on a single generation in the medieval era. 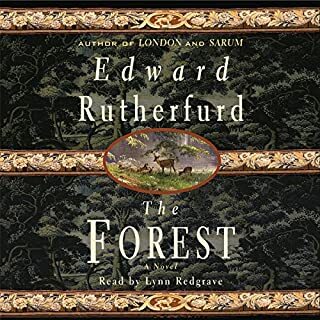 Stylistically, Edward Rutherfurd is a plain and unembellished writer and he often relies on cliches and tropes, particularly all the women with their "firm young bodies" from paleolithic times onward, and the aforementioned repetition of family traits, from the Wilsons' "long-toed feet," dating back to the Ice Age, to the precise fussiness of the Porters, dating back to their Roman ancestor. Chapters begin with a lot of historical exposition explaining what's going on in this era, then zooming into what our families are up to and which side they're taking. But none of this was a detriment to me; it was a long, long listen and very satisfying. The time spent to research and write an epic spanning over 10,000 years and yet get us personally invested in the lives of individual people made it well worth it. 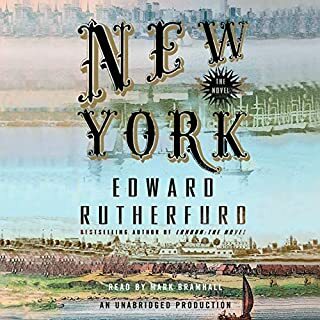 I liked it enough that I am pushing Rutherfurd's New York epic higher on my TBR list. 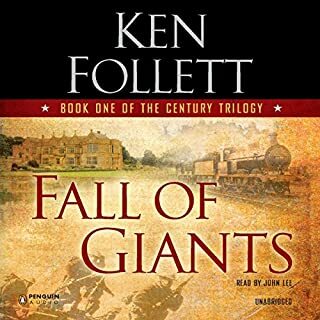 This is a big fat historical epic to satisfy anyone who likes these kinds of books. Wanda McCaddon's narration was steady and professional throughout - there were a few times when her voice sounded a little shrill, but she handled male and female roles with the perfect British accent. 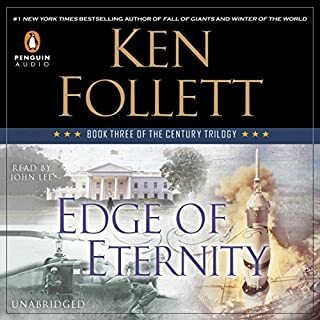 The only place she fell flat was, predictably, the American characters (hardly any Brits can drawl Yank believably), and they only show up briefly in the very last chapters. The performance and the story are wonderful. I think Wanda McCaddon does a fine job changing her voice around for each character. However, the skips in the tracks where the audio seems to jump forward leaves much to be desired. I hope Audible can get fixed tracks soon. If you love history, if you love long books, you will love Sarum. It was the first Rutherfurd book I read and have since read everything he has written. I absolutely do not have a problem with Wanda McCaddon's narration, I think she did a phenomenal job of reading and you must remember she was reading the book. 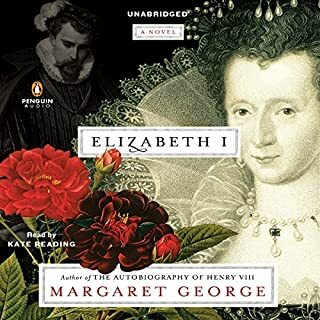 If you get bored with long books of history this one is probably not for you, however, I listened to it twice, and found it was easier to keep the families straight through the name changes, on the second listen. (aka Doneda Peters and Nadia May) because you'll be listening to so much of her here - and from reading reviews of other books she's narrated, listeners usually have a love or hate relationship with her. She has an older-style narration (Talking Books) and she shines in classics with multiple-claused sentences and in nonfiction. 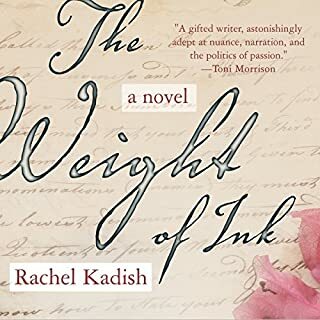 I love her, and that was the tipping point for this download for me -- because although I love historical fiction, I usually can't stand anything earlier than early a 19th century setting. He does take century long leaps in time and in conjecture, but after about ten hours of listening, this starts to seem natural! I did not experience the technical glitches mentioned by other reviewers, BUT it does sound like an older quality recording (back when Wanda was getting paid about $15 a hour). So know what you're getting before you hit "cart" -- or like me, if you have days to fill with listening, take a chance in case you too will be pleasantly surprised. 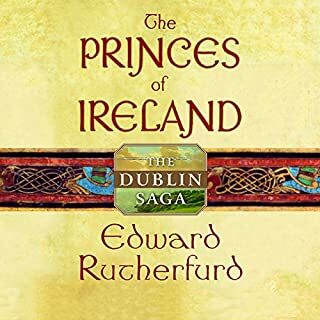 Rutherfurd has authored a captivating tale that chronicles the fortunes of several families as the story weaves through significant periods in English history. The story lines of the individual families remain true to historical events and, in some small way, allow us to experience what life in those times may have really been like. I had some initial trepidation on the choice of Wanda McCaddon as narrator. However! Twenty minutes into the book and I was sold and thereafter thoroughly enjoyed her rendition. I'm not sure if I have read every book by Edward Rutherfurd, but if I haven't it's merely an oversight. This author has never written anything I didn't like, but this is one of his great ones. Not his ONLY great one, but one of them. It is the first one I read and I've been hooked since. It's the story of the Salisbury plain, but it is, in a way, the story of humankind. It is rich, it is a tapestry that is both broad and intimate. It is everything you could possibly want in this kind of fiction. I have read it in print, but listening to it may be even better. I listened with a sigh. oh blast! I thought; I'm now definitely going to maintain my reputation for fussiness over pronunciation. First, Wanda McCaddon aka Doneda Peters; is a well known reader to me. I've listened to many of her performances, and like her voice very much. She adds character without over doing it; and rarely lets one down. This performance is mostly brilliant. Only one tiny (but teeth grinding) problem. Nobody explained to her, the all important rules of Celtic pronunciation. No soft C's....F is pronounced like V, no soft G's. So when she said "Selt" rather than "Kelt" in virtually the first line, I was a little dismayed. "The Roman's pronunciation sounded strange to the Celts' ears" Actually, the Roman pronounced Afon correctly, the Celtic way. I know, we've established that I am an irritating fusspot....but...in a reading of a book, these little things can make or mar the telling. Luckily, Wanda's overall performance is up to her usual star turn. I hold the researchers and producers responsible for these slips. The book itself is extraordinary. 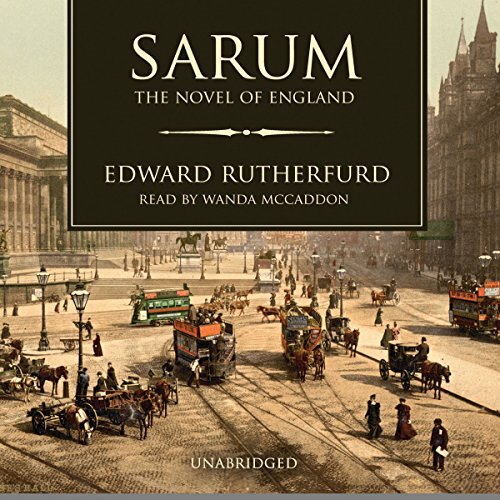 Rutherfurd brings us an history of a part of England; that is rich and compelling. If you happen to know the area well (as I am lucky to do) the story becomes even more fascinating, as you feel the development and changes over the centuries. 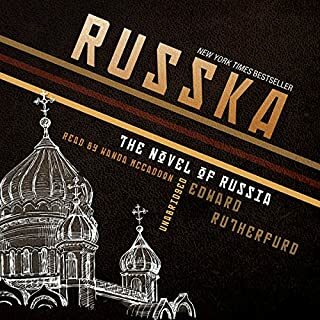 I have read other Rutherfurd books, his "London" remains locked in my memory. I love the way that Rutherfurd gives his characters small identifiable physical characteristics, so that one may recognise the line of descendants over the story. 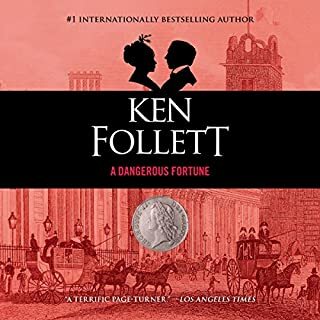 Wonderful story for lovers of England, British history, and particularly Salisbury and Wiltshire. 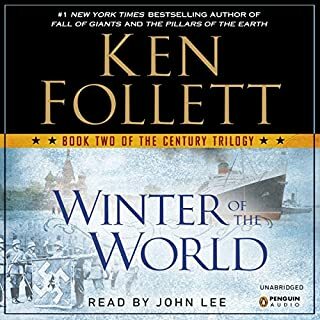 Overall brilliant....how does one describe an audio equivalent of a page turner? I couldn't bear to take out my earbuds......I worked happily on cleaning /sorting tasks for hours allowing the story to transport me. What made the experience of listening to Sarum the most enjoyable? you will probably enjoy this book. 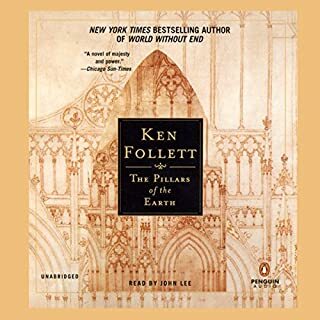 Indeed,I think I enjoyed Sarum more because I had listened to Pillars first. Pillars covered a smaller time period in more detail. Sarum covered more time in less detail. Starting in pre-historic times, the book is a series of short stories, following a family through thousands of years and showcasing many historic events. 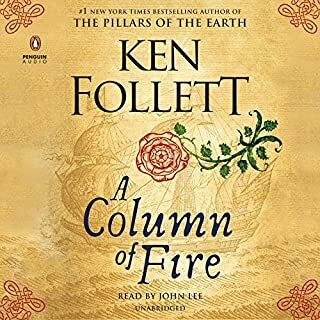 Although this is already a very long book, it seems that, just about the time I am really enjoying the characters and story, it abruptly ends. Then you are moved forward hundreds or thousands of years to find the family's descendants involved in another historical event. 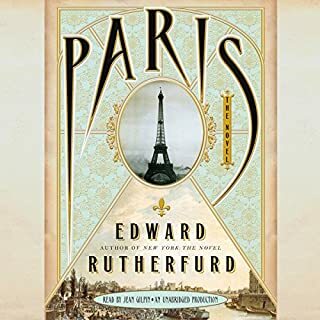 One of the most interesting aspects of the book is how Rutherford shows which people are related to whom in each prior story through physical characteristics, personality and surname evolution. If you like history, genealogy, England - you will enjoy this story. What other book might you compare Sarum to and why? No, but I enjoyed this one. If you could rename Sarum, what would you call it? I would not rename it. The name is perfect. Rutherford performs at his usual high standard. I'm always entertained and informed by his work. Unfortunately, the narrator/production crew fell short. 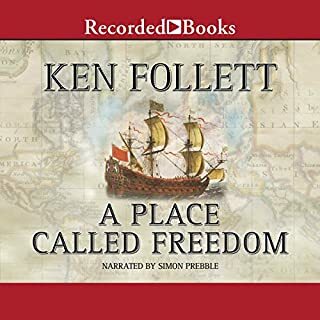 Although the narrator has a soothing but authoritative voice (to me), there are numerous odd pauses that could have been edited, as well as deficiencies in the audio file (skips, gaps). Perhaps minor quibbles, but annoying nonetheless. I love reading Rutherfurd's books. I love following families and seeing how historical events in history shape the lives and fortunes of succeeding generations. Anyone who enjoys history will enjoy this as well as all of Rutherfurd's books. Details of historical events are accurate and seeing them through the eyes of the characters brings them alive. My only disappointment is the narrator. 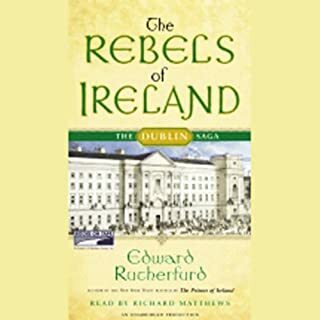 In the Ireland series the narrator was perfect and I was somewhat disappointed in the reader of this book. While she has a lovely voice, the constant swallowing bothered me. Her voice sounds old. Otherwise, I loved the book and would recommend it to anyone interested in historical novels.